Fitted with a fully-fledged advanced mission suite, the Falcon 900 MPA "Maritime Patrol Aircraft" is able to detect all kinds of threats and react with the appropriate response. Fitted with a fully-fledged advanced mission suite, the Falcon 900 MPA “Maritime Patrol Aircraft” is able to detect all kinds of threats and react with the appropriate response. Like the Falcon 2000 MRA, it offers outstanding operational flexibility as well as excellent performance. The long-range maritime patrol aircraft “Atlantic” / “Atlantique” family delivered to five different navies and air forces. The Falcon family aircraft modified for maritime surveillance and operated by the French Navy and by several foreign Coast Guards. It is a unique concept of high performance, low cost and low risk development, long-range maritime patrol aircraft. Derived from the Falcon 900 DX business jet, the Falcon 900 MPA is perfectly sized for maritime patrol missions. It is persistent, capable and safe. From the onset of the project, the state-of-the-art mission system and the sensors suite, as well as the platform have been developed with the necessary growth potential provisions, in order to meet new requirements that could arise during the long life of the aircraft. Naval forces training (target towing, EW simulation…). The Airframe of the Falcon 900 MPA is based on the Falcon 900 DX. The Falcon 900 MPA is powered by three Honeywell TFE 731-60 engines with 5,000 lbs thrust. Each engine is monitored by a Digital Electronic Engine Computer (DEEC) allowing the best efficiency with the minimum fuel consumption, during each segment of the mission. The flight deck is designed for a two-pilot configuration. The full glass cockpit “EASy”, defined by Dassault Aviation is the most advanced flight deck system in the world. It dramatically increases safety and efficiency of the crew during all the phases of the mission. The mission system of the Falcon 900 MPA incorporates state-of-the-art technologies in both sensors and sub-systems. It allows carrying out efficiently the various tasks dedicated to a multi-mission aircraft operated by a reduced crew, thanks to analyzing systems and automatic functions. The operational efficiency stems directly from performance and availability. In term of performance, the Falcon 900 MPA is far ahead from same class competitors. Capable of very high cruise and maximum speeds, the Falcon 900 MPA provides with a wider domain of operating speeds. Furthermore, it is capable of higher acceleration rate, longer range, longer endurance and higher cruise altitude. The state-of-the-art mission system and sensors suite, combined to the outstanding aircraft performance, allow patrolling at medium or high altitudes, thus dramatically increasing the surveyed areas during each mission, in a shorter time. 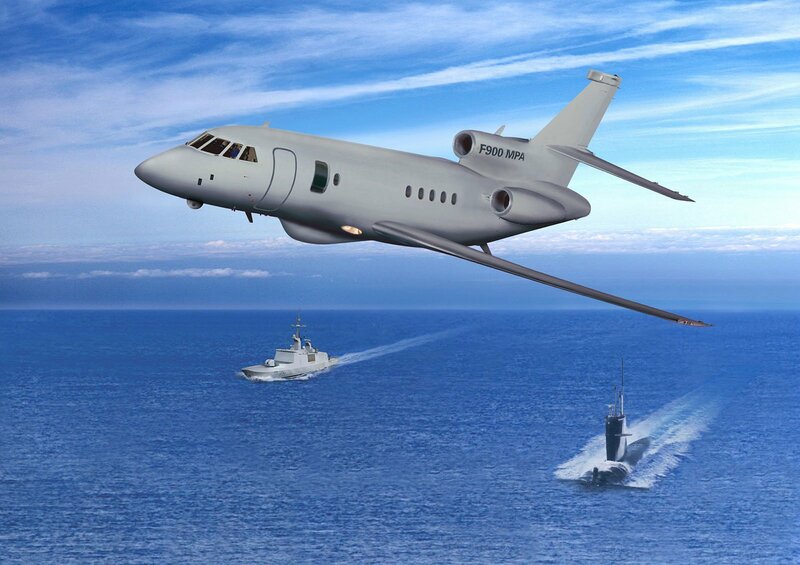 The Falcon 900 MPA can reasonably be compared to the upper class of large maritime patrol aircraft. Based on a business jet platform, the Falcon 900 MPA is particularly adapted to long lasting flights. This is a key factor, contributing to the crew efficiency. The Falcon 900 family demonstrates a very high reliability rate and features a very light maintenance footprint. Thus, the Falcon 900 MPA can be rapidly deployed to Forward Operating Bases, from where it can be operated without any need for Ground Support Equipment (GSE) or specific ground crew. Safety is a paramount when flying at low level over the sea in all types of weathers. With three engines, the Falcon 900 MPA has been designed for transoceanic flights. The Falcon 900 MPA demonstrates such performance and safety records that it is capable to be ferried with one engine inoperative. If a bird ingestion hazard or an engine failure occurs at low altitude, the Falcon 900 MPA may benefit from its three-engine configuration to keep on performing temporarily the critical mission. This three-engine configuration also eases return to mother base or to reach a service centre instead of being stuck on a deployment airfield, until the problem has been fixed.